Shari’ati, for a number of reasons, objected to limiting ones political activities only to student politics in Paris where he mocked those who sat in cafes, meetings and conferences analyzing, concluding, and planning from afar. Cafes in the 50s and 60s fostered the exchange of new ideas and were home to debates among luminaries. Regardless of his at times scornful account of the cafe culture in Paris, such environments played a significant role in his personal development and political activism in Paris. The cafes mentioned in this section were highlighted in Shari’ati's writings. 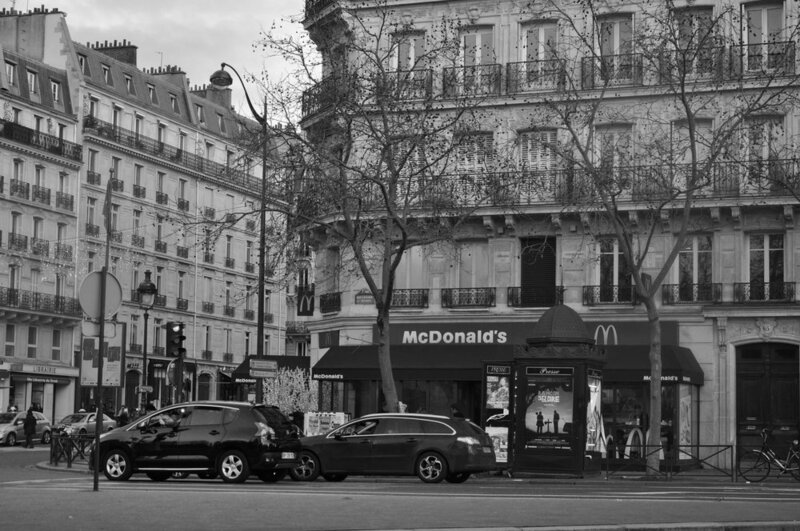 Shari’ati wrote about a (fictive) conversation with Chandel at this cafe located at the intersection of Boulevard Saint-Germain and Rue de l’Université. We do not know if the personalities at the cafe were Chandel and Chappelle, however, we know that the author (Shari‘ati) is melancholic and depressed and wished to talk to his interlocutor and asked his interlocutor for a meeting at 3:30 pm at the south-western side of Café des Arts. S/he asked him whether he was going to be on time or late again and Shari‘ati responded that he would be on time sitting alone at a table for two. One can surmise that he was frustrated by being misunderstood and needed to confide in someone who knew him well and that he could trust, hence a meeting with Chapelle. It is important to note that in the 32-page account there is no direct reference to Chapelle, even though the reader familiar with Shari‘ati’s texts has the intuitive feeling that his interlocutor was the enigmatic Madame Chapelle. Reference: Shari’ati, Ali. Goftegūhay-eh Tanhāī. Collective Work, Vol. 33/1, p. 516. Note: This address is the only place where the cafe would have been at the intersection of Boulevard Saint-Germain and Rue de l’Université, which is how Shari’ati described it. This cafe is currently called Café des Arts and could potentially be the cafe he was trying to remember while writing the story. It is not on Boulevard Saint-Germain nor Rue de l’Université. However, it is in the Saint-Michel neighborhood. Refernece: Shari’ati, Ali. Goftegūhay-eh Tanhāī. Collective Work, Vol. 33/1, p. 516. 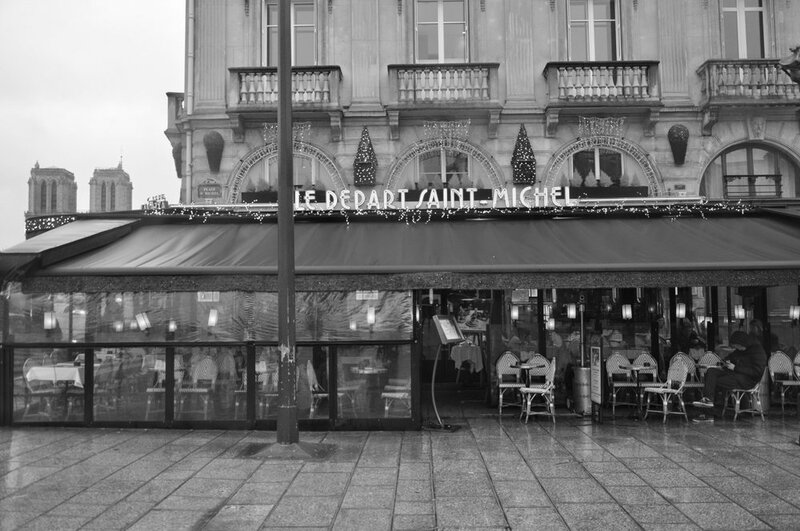 In this story Shari‘ati wrote about a third person who went to a cafe on the corner of Denfert Rochereau, sat at a table for two facing the street, ordered a birnache, and smoked away until the sun left Paris. Shari’ati did not write directly about himself, but probably a kindred spirit, another Shari‘ati, who smoked the way he did and was as introverted as he was. The story took place five years after the liberation of Paris, meaning it had to be in 1949. (C.W. 33, vol. 2, p. 1027) This is another one of his inter-temporal displacements. His enigmatic word birnache is a typical Shari‘ati concoction of bière (beer) and nache the second part of panaché. Reference: Shari’ati, Ali. Goftegūhay-eh Tanhāī. Collective Work, Vol. 33/2, pp. 1027-1030. The three windows on the left belong to the small room on the second floor. Shari‘ati met Naser Pakdaman through Hassan Qazi, a fellow Mashhadi, to seek council on his future field of study after he arrived in Paris. This meeting took place on the second floor of this smoke-filled cafe. Note: Pakdaman pointed out that Café Mahieu had a Tabac and the room on the second floor was frequented by Iranian students looking for a place to study. Pakdaman mentioned in a conversation with Maryam in January 2018 that student living spaces were not suitable for studying and libraries did not have the capacity for the students in Paris. Therefore, the best alternative for a study space was a cafe. On a number of occasions between 1962 and 1964 Shari’ati met Homa Nateq and other friends at this cafe on Sunday mornings and discussed Seyyed Jamal al-Din Asadabadi, the topic of Nateq’s research. Shari’ati viewed Asadabadi as a pioneer of Islamic revivalism and was curious about his membership in the Free Masons. Reference: Rahnema, Ali. An Islamic Utopian: A Political Biography of Ali Shari’ati. I.B. Tauris & Co., 2014, p. 128. This cafe, owned by Madame Lea Canan, is in close proximity to Shari’ati’s apartment on Rue Gutenberg. Shari‘ati would go to the cafe with Solange and this is where we are told Shari‘ati declared his esteemed love for her. This is based on conflating Shari‘ati’s own accounts of Solange and himself at what he called Chez Canard, which in actual fact was called Chez Lea Canan and a poem written in French (not translated by himself into Farsi) in Dialogues of Solitude. The owner of the cafe, Lea Canan (which Shari’ati refers to as Madame Canard) was an old white-haired chatterbox who fondly called him Ali Baba. When she was serious in the presence of Shari‘ati and Solange, she would call him chari or charité. The cafe existed until 1992 under the management of Madame Canan. Reference: Shari’ati, Ali. Goftegūhay-eh Tanhāī. Collective Works, Vol. 33/1, pp. 299, 583-584. / Rahnema, Ali. An Islamic Utopian: A Political Biography of Ali Shari’ati. I.B. Tauris & Co., 2014, pp. 171-2.